If you have read my post, A Storytelling Fireplace, then you already know we recently rearranged our living room setup. But, before we did, this was our original arrangement for what was the dining room portion of the area. We do not have a big and beautiful china cabinet full of fine china, but I felt this was a nice country inspired substitute. 🙂 Let me just say, I apologize for the not so fantastic picture quality; I did not manage to get nicer ones before we moved everything. 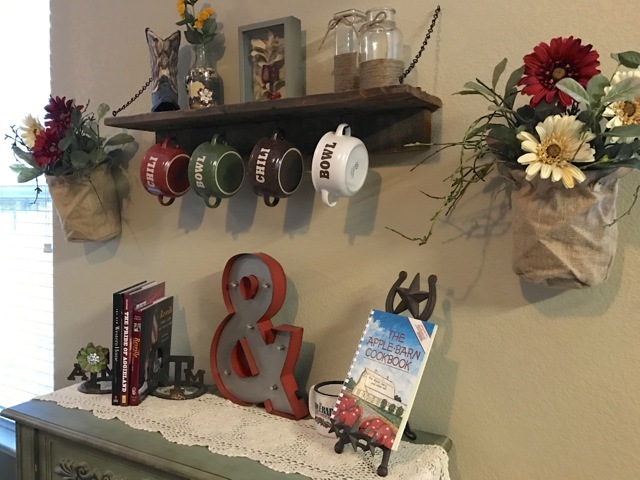 I loved this set-up for the dining room area because it was able to showcase some conversation starters, such as college stories, our favorite vacation spot, and The First Rose my husband gave me, all while storing additional serving wear in the buffet cabinet. 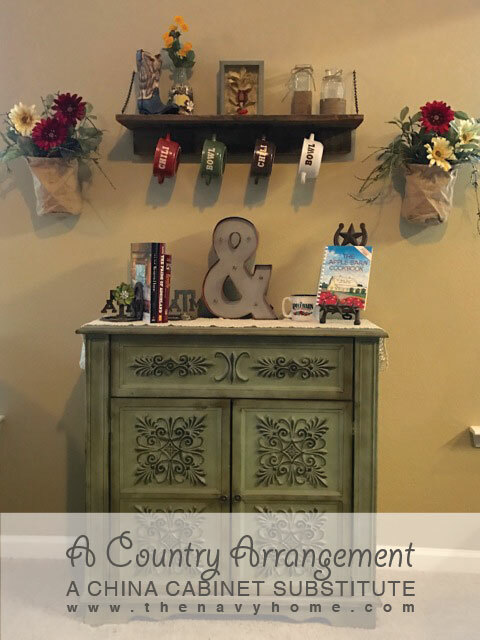 This country arrangement was a fun and decorative statement to the room that added storage and color to the standard barren rooms of rental properties. One of the things I love about this particular piece of furniture is its versatility. A china cabinet is exactly how it sounds, a cabinet for fine china, and most always located in the dining room. However, this buffet cabinet is really just a cabinet that can be used for anything and in any room making it a great choice for those who move often. Another perk is the reduced size of this cabinet versus a china cabinet. This allows for greater versatility in where the piece will fit in each given room or new home. After you have your required storage, all you need is to decorate! Choose some decorative conversation items if the arrangement is in one of your common rooms where guests will be. Be sure to appropriately balance your pieces with one another and with both the size of the room/wall. For example, the Pallet and Chain Shelf adds a nice upper balance to the weight of the buffet cabinet below with its size and quantity of décor. You want to avoid overtaking or understating your décor in each space of your home. The floral arrangements were originally for the townhouse that I shared with my brother during college. My brother did not want any décor that was “too girly,” but I had already found these adorable burlap bags and had to get my floral arrangements in them somehow. 😉 So I decided to use flowers that were not too feminine in both color and appearance with greenery. The key element here was I chose to use a more masculine twig-like greenery and moss to seal the deal. I explained to him my balance between masculinity and femininity in the arrangement… I am not sure if he actually bought my reasoning, but he caved either way! We would love to hear what you have to say! Please leave a comment below!